We have all heard of it, ghosting is certainly not something anyone wants to experience. There is nothing more confusing than having someone disappear from your life without a word, or any explanation. The truth is there are sometimes signs and reasons we just don’t always recognize right away. Some people are more capable of ghosting others or finding ways to blow them off, while others find it challenging to follow through with. 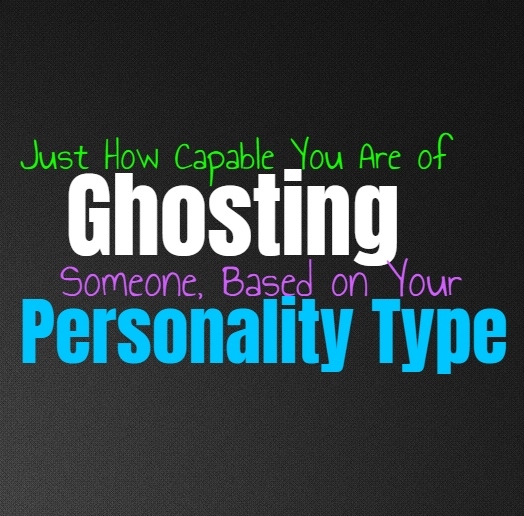 Here is how capable of ghosting you are, based on your personality type. INFJs might not ghost people in the typical sense of the word, since this choice takes a long time for them to make. If the person has continued to ignore the INFJs needs then they might feel like they have been ghosted. INFJs will door slam and shut someone out of their life when they know it is the best choice for them to make. They do something which appears like ghosting, but in truth they have expressed a need for change many times before it reaches this point. They are capable of shutting people out and not continuing to respond to them, almost like they don’t exist. ENFJs are actually very capable of ghosting someone, especially when they have grown tired of their behavior. ENFJs care about others but they won’t continue to let themselves hurt just because someone refuses to change. They do often express their needs and show that something is wrong, but if the person refuses to listen they might experience ghosting from the ENFJ. When they finally make the choice to cut someone out of their lives they often need for this to be something concrete, and so continuing communication just isn’t something they can do. INFPs aren’t usually fans of ghosting someone, but at the same time they don’t like conflict. If they feel like the only way to avoid being attacked or experiencing a negative response is to ghost someone, then they might do this. Usually this happens when the INFP feels a bit afraid of this person, or like they cannot completely trust how they will respond. Most of the time INFPs feel the need to express themselves and share their feelings, but sometimes ghosting is the only way to really escape. ENFPs don’t usually ghost people but it isn’t something they are incapable of. They don’t enjoy conflict and so sometimes they find themselves shutting people out and trying to avoid getting into an argument over it. If they feel they need to remove someone from their lives the ENFP might naturally find themselves ghosting this person. They don’t like having to make it clear that they want to let go of this relationship, so sometimes it is easier just to pretend it never happened. INTJs aren’t necessarily incapable of ghosting people, since they don’t always have the patience to deal with arguing over the situation. When the INTJ has created a long term and serious relationship, they are unlikely to ghost this person. They are much more likely to make things clear and express that they need to disconnect. If the person does continue to try and push the INTJ to change their mind, they might need to shut them out but this isn’t the same as ghosting someone completely. When it comes to people they aren’t very close to, they aren’t against ghosting these people. ENTJs are unlikely to ghost someone they are very close to, even if they need to end this relationship for some reason. In these situations they will try to make it clear that they need to move on, and want to give that relationship the goodbye it deserves. When it comes to friends or connections which they aren’t that serious about, they might actually find it easy to ghost these people. If they don’t feel particularly close to someone then the ENTJ doesn’t see the point in wasting their time giving an explanation. INTPs can sometimes be distant people who enjoy spending long periods of time on their own, but they aren’t actually the type of ghost people. It might seem like they are ghosting someone, since they can go a rather long time without speaking to them, but they will likely come back to communicating with this person eventually. It isn’t that they are ghosting, simply that they are needing some space and time to themselves, but this isn’t something they want to be permanent. For the most part INTPs aren’t likely to really ghost someone, even though they might shut them out for a little while if they are mad. ENTPs actually might be capable of ghosting someone, but it also might not be something which lasts. If they are trying to shut out someone they care for, the ENTP might disconnect from them only to find themselves going back later on. They do sometimes feel the need to shut people out, wanting to disconnect without needing to really hash things out. They aren’t afraid of conflict but they do sometimes need to avoid becoming too emotional over the choice they are making. ISTJs aren’t really fans of ghosting people and would rather make their intentions and boundaries clear. If they need to move on from a connection they want to show them respect by making this clear and expressing their reasons why. ISTJs aren’t afraid of moving on and letting go if they need to, but they don’t like simply ghosting someone. They believe in trying their best to make relationships last and they don’t believe it is fair to just walk away without some sort of explanation if it seems there is no solution to their problems. ESTJs aren’t afraid of making their intentions clear and will often tell someone why they are moving on instead of just ghosting them. Most of the time this feels like cowardice to the ESTJ, and so they don’t have much respect for people who just ghost others. They might be capable of slipping away from someone they aren’t that close to without really telling them why, but any real connection the ESTJ wants to be sure the make their reasoning known. ISFJs don’t like the idea of just ghosting someone, but at the same time they aren’t fans of conflict. When it comes to most relationships they will make their reasons for moving on clear, and will likely have already expressed them many times before. If someone won’t hear them or refuses to accept the ISFJs explanation, then they might feel like they have to shut them out completely. This isn’t quite the same as ghosting, since the ISFJ likely already expressed that they need to move on but that person just is not hearing it. ESFJs try to avoid ghosting people, since they idea of hurting someone this way feels cruel. They believe in closure and often need to express their reasons for moving on rather clearly. Sometimes they can become distracted by other things in their lives, and can sometimes lose the patience to communicate with certain people. While they might not always be as communicative with that person, it doesn’t mean they are intending to ghost them or shut them out completely. ISTPs do have a tendency to move from one thing to the next rather quickly, but that doesn’t necessarily mean they ghost people. They usually are fine keeping certain people in their lives even if they don’t speak constantly. ISTPs don’t always just shut people out simply because they don’t want the same type of connection with them as before. For them it is best to remain friends even if it is from a distance. ISTPs might find ghosting to be cruel, but at the same time they aren’t always great at giving detailed explanations for why they want things to change. ESTPs aren’t likely to ghost people most of the time they make it clear that they need to move on. Sometimes they find themselves shutting people out or blocking them, but they are capable of giving an explanation beforehand. This often happens because they need to disconnect from the feelings they have for that person, not because they are afraid of dealing with the conflict. ESTPs actually aren’t afraid of conflict, and would rather hash things out than just ignore it. ISFPs might ghost people without really meaning to, since they aren’t fans of conflict and don’t like hurting people. They often feel like just ghosting that person is easier than expressing the fact that they want to end their connection. ISFPs also change their minds fairly often and become uneasy when someone refuses to accept this. If they deal with someone who continues to push the issues, they will certainly be capable of ghosting that person. ESFPs are social and friendly people who prefer to maintain their friendships and connections. They really don’t want to make enemies and would rather find a way to smooth things over. Most of the time ESFPs prefer not to ghost people, but that doesn’t mean they are incapable of it. If they feel like they need to completely disconnect from someone in order to avoid conflict or strain, they might feel like this is the only option they have and will certainly be capable of it.